S. S. Stewart American Princess #3 Model 5 String Banjo (1892), made in Philadelphia, PA, serial # 12506, natural varnish finish, spunover rim, cherrywood neck with ebony fingerboard, black gig bag case. 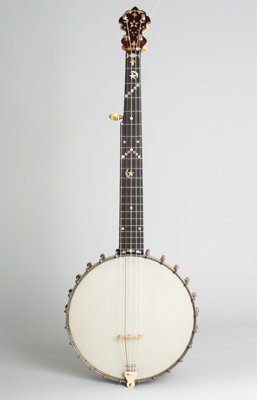 The charmingly named "American Princess" is what was termed in the 19th century a "Ladies' Banjo", basically a scaled-down version of the standard 5-string with a short scale neck and smaller 10" head. This was essentially the creation of Philadelphia's S.S. Stewart, and this one is a lovely example of his factory's best work. These instruments could be tuned to the standard low "A" tuning of the time or a higher pitch to play melody parts in the banjo ensemble. They are somewhat rarer than the standard size instruments as a general rule. This lovely little Stewart was the highest standard grade of this model. It features a cherry neck and ebony fingerboard with mixed diamond, moon, and star inlay, and a fancy inlaid headstock. The neck heel has a fairly elaborate carving pattern and a pearl inlaid ebony heelcap. The inside of the spunover rim has attractive faux-rosewood graining and ivoroid "American Princess" tacked badge. The dowel stick carries an inlayed celluloid "S.S. Stewart, Phil'a PA" logo tag alongside an impressed "SSS" headstock-shaped logo. This is a lovely banjo to play, and a delightful example of a medium-grade Stewart in nicely unmolested condition. Overall length is 30 1/2 in. (77.5 cm. ), 10 in. (25.4 cm.) diameter head, and 3 1/4 in. (8.3 cm.) in depth, measured at side of rim. Scale length is 22 1/2 in. (572 mm.). Width of nut is 1 1/8 in. (29 mm.). A very nice original banjo, far better preserved than most from this era. The finish and plating show light wear, with some plating loss on the brackets and shoes. All hardware is original including the complete set of early friction tuners and bone tailpiece. This is a very fine playing banjo; it was built for gut strings originally but could be adapted to steel if desired. It is currently set up with a plastic head, repro period bridge, and Nylgut Classical Banjo strings and has an archaic but enchanting tone, somewhat brighter than larger-rim banjos of this style. Excellent - Condition.